Albuquerque; St. Paul, Minnesota; Portland, Oregon; Alaska; South Dakota; Olympia, Washington; Berkeley, California; Minneapolis; Seattle; Andarko, Oklahoma. Should Durango join this list of cities that have switched from Columbus Day to some version of Indigenous Peoples Day? Fort Lewis College student Ruthie Edd thinks so, and she’s not alone. There are a lot of reasons the change makes sense for Durango, Edd said, including the history of the honoree. Perhaps the most important reason for Durango to make the change, Edd said, is its location. Situated near both reservations in Colorado, the Southern Ute and Ute Mountain Ute Indian reservations, near a wealth of sites of pre-Columbian populations as preserved at Mesa Verde National Park and Chimney Rock and Canyons of the Ancients national monuments, as well as being seated near Mount Hesperus, one of the Navajo Nation’s sacred mountains, Durango is clearly set in Indian Country. Most history books in the United States, The Atlantic writer Jake Flanigan said, cover Native Americans as discovered by Columbus, sharing a Thanksgiving with Puritan pilgrims, defeating Custer at the Battle of the Little Bighorn and dying on the brutal Trail of Tears. That exciting story is a large part of the purpose for the Real History of the Americas at FLC, which had a theme of “Telling our stories through dance” this year. Among the activities offered Monday were an opening prayer by Betty and Eddy Box Jr., a “Basket Weaving Dance” by FLC alumna Anne Pesata, and I am Dance workshop with facilitators from Common Ground, a bilingual “Star-Spangled Banner” in English and Diné (Navajo) by FLC student Olivia Duncan and a performance by Ballet Folklórico de Durango. A 12-hour experience, with attendees coming and going throughout the day, Real History drew from a diverse crowd of all ages. Real History’s goal is to take a different look at history through the viewpoints of Native American, African, Hispanic, lesbian, gay, bisexual, transgender, questioning and Asian peoples. That was the focus of Las Cafeteras’ “Racism: ‘Ain’t Nobody Got Time for That!” Las Cafeteras, this year’ guest artists, hail from East Los Angeles and have created a participatory workshop on breaking down stereotypes. Band member and playwright Daniel French said history tends to be written from the perspective of white, wealthy, educated, able-bodied men. French told Columbus’ story from the perspective of the Tainos, the indigenous tribe of the island in the Caribbean Sea where the explorer first landed. 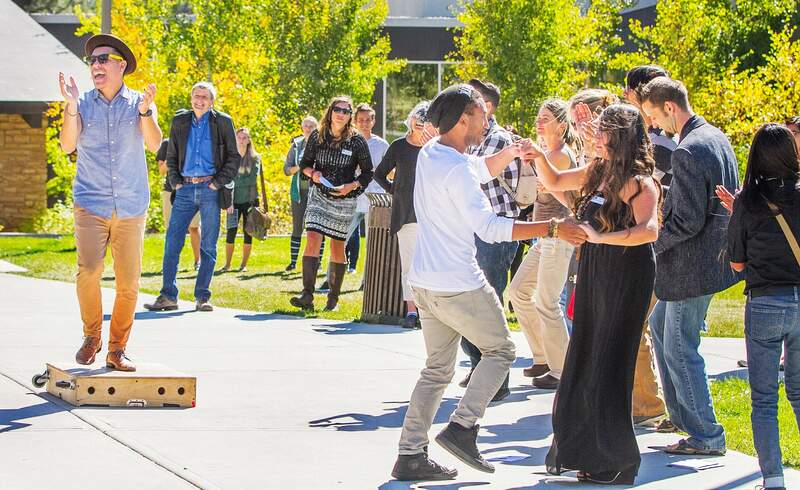 As students and faculty dance, Hector Flores, left, with the band Las Cafeteras, performs in front of Reed Library on the campus of Fort Lewis College on Monday as part of the Real History of the Americas series of workshops and performances on campus. Las Cafeteras, whose members hail from East Los Angeles, perform a multilingual fusion of traditional, hip-hop, folk, Afro-Mexican and Latino music. 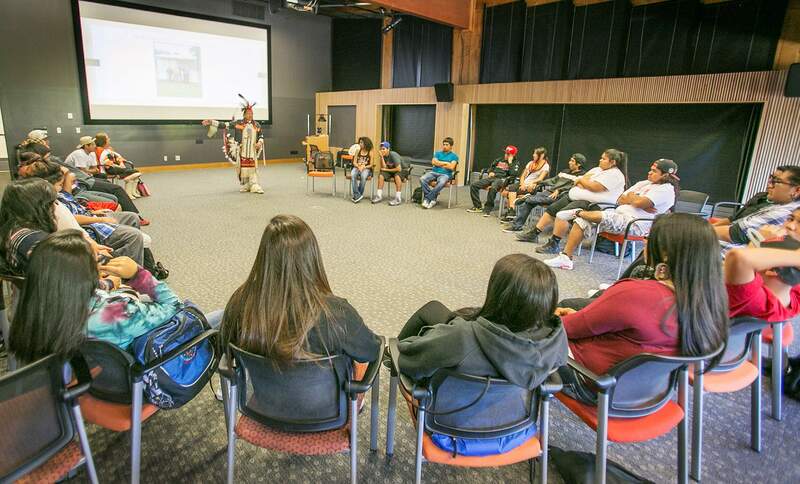 Joely Proudfit, the director of the California Indian Culture and Sovereignty Center at the California State University San Marcos, will present Beyond the Stereotype at 6 p.m. Oct. 28 in Noble Hall Room 125. The lecture is free and open to the public. 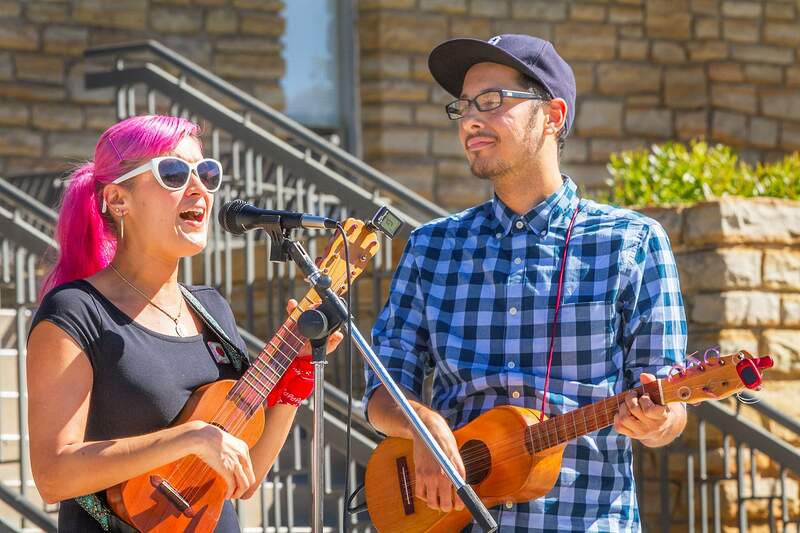 Denisa Carlos, left, and Daniel French with the band Las Cafeteras perform at Fort Lewis College on Monday. The band also hosted a workshop called “Racism: Ain’t Nobody Got Time for That!” during the day at Real History.